Pakistan has been a hotbed of terrorism and militancy for almost a decade now. In this period of time, more than 50,000 people have become victims of terrorism with the north western areas being especially vulnerable to militancy and bloodshed. Many Pakistanis see the country’s future as dark and hopeless, however, Ansar Abbas is not one of them. “I don’t like to be labelled as disabled or a victim”. Currently working as a news editor with a news agency in Pakistan, Ansar is pursuing his career confidently and hopes to make Pakistan a better country. He also worked as a field monitor in DI Khan for PakVotes for the recently concluded by-elections. The life of Ansar Abbas is a true story of hope and resilience. He hails from the north western city of Dera Ismail Khan. Son of lawyer Syed Muzaffar Shah and youngest among his ten siblings, he belongs to a noble family in his district. 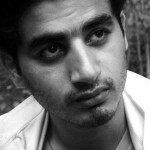 Ansar drew inspiration from his father, as he was well connected to literary circles. This also encouraged Ansar to take up Mass Communication as a subject for his Masters’ degree at the Gomal University, DI Khan. Having completed his Masters’ in 2006, he began his career as a journalist with a national daily. However, as fate would have it, around five years ago his life changed forever. On August 19, 2008, while in Dera Ismail Khan, Ansar came to know about a target killing incident in the city. He reached the district hospital along with other reporters where he learnt that the victim belonged to his family. Soon, many of his family members and others gathered at the hospital. There was a crowd of some 200 people there when tragedy struck; a suicide bomber blew himself up, resulting in a death toll of 32 people. More than 50 people were injured, and Ansar was one of them. He narrates how around 20 of his relatives and friends died on that tragic day. If this trauma was not enough, both his legs were also fractured in the blast. He was sent to Pakistan Institute of Medical Sciences (PIMS) hospital, Islamabad the next day for treatment, where he was operated on almost 50 times in six months. He recovered physically with the passage of time but lost his arms. Ansar’s real arms were replaced by artificial ones which he cannot even move – such is the sorry state of prosthesis in Pakistan. Yet, Ansar did not lose hope. He did not give up, and he moved on. And that is what he has successfully done. He restarted his career in journalism with a renewed vigour. Though it took almost two years to fully recover, he started using the computer while sitting on a wheelchair at home, and he learned to use his toes as his fingers till he mastered the skill of typing with his feet. Ansar started using social media and connecting with people from different parts of the world. He wrote blogs and articles narrating various incidents of terrorism in his home town, criticising the militancy and addressing terrorism related issues. Last year, he completed another Masters’ degree in Political Science. An activist, Ansar Abbas is keen on working for social welfare. He, along with other people of his area, organises sports and other events for the welfare of Dera Ismail Khan. He is also helping an organisation working for disabled individuals, which once helped him too. In Pakistan, sectarian killings are on the rise and the people of the north western areas of Pakistan, especially Dera Ismail Khan, still remain the main victims of sectarian killings. Incidentally, Ansar thinks otherwise; according to him, DI Khan was once known as the city of flowers. There were no sectarian killings among Sunnis and Shias in the past. He also believes that sectarian harmony among the local people still exists. He says that right after the the suicide bombing incident, the first person to donate blood to him did not even belong to his sect. Given from where he is coming, Ansar is not in favour of negotiating with the militants and also critical of the role of government and security forces to counter terrorism. “If incidents like Bannu and Dera Ismail Khan jail breaks continue then how will we eradicate terrorism?” he asks. Confident and hopeful that someday in the near future Pakistan will see peace again, Ansar pays a rich tribute to the people of Pakistan, who, in spite of countless acts of terrorism that devastate their lives, are still moving forward. “Pakistanis are brave people and they will never let militants to takeover this country,” says Ansar, a proud, hard working Pakistani himself. Please check prosthesis companies in India. A quick search got me this website. If only we had more people with the spirit and determination of Ansar Abbas this country would be a better place. These acts of terror have destroyed the lives of many in Pakistan. I wish to see peace prevail throughout the country. Ansar’s story serves as an inspiration to others. I wish him best of luck in all of his future endeavors.